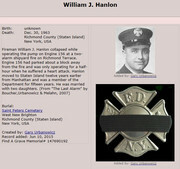 ALL INFORMATION IN THIS TREAD ACCESSIBLE BUT NO NEW INFORMATION CAN BE ADDED - THREAD CONTINUES IN "FDNY AND NYC FIREHOUSES SECTION 2" WITH NEW INFORMATION, COMMENTS AND REPLYS. Many NYC firehouses and berths served as quarters for FDNY, Brooklyn FD, Long Island City FD, fire patrols, police, airport, federal, military, commercial and volunteer departments and companies. The original sheds which housed the first fire companies formed to protect NYC in the late 1700s and early 1800s are gone. But many of the original firehouses built by the volunteer departments, FDNY, Brooklyn and LIC in the mid and late 1800s still exist - some operate as active firehouses, some serve community, business or housing purposes. Current FDNY firehouses include historic and new state-of-the-art fire stations. This thread is dedicated to the firehouses, their companies, their apparatus, their histories and the firefighters who served in them. Directly behind 10 & 15's quarters is the 1st Precinct building which I believe still stands and is the NYPD museum. Did anyone notice the chain across the apparatus doors on the fire house? I wonder what that was for? Chain was to keep out buffs. Many FHs had the chain ...if you look at the sides of some doors you can see marks where it was fastened about waist high.........i had worked a few tours in Marine 2 when i was a LT......the whole bldg creaked & rocked....it was like a bldg on the water in the Orient. Coney Island is known for more than its' amusement parks, fine hotels, beaches, and hot dogs. During the turn of the century over 250,000 postcards would be mailed to every corner of the globe on any given weekend during the summer season. Because of these postcards, the area became a magnet for people. The area was densely packed with poorly built shanties, with narrow walkways between them. With the high density, cramped condition, Coney Island also attracted the seedier side of life with gambling, saloons and the ladies of the night. This all lead to what Coney Island is also famous for, conflagration on a grand scale. Coney Island was first settled in the late 1600's by the Dutch. The name "Coney" comes from the Dutch word "Konijn" meaning wild rabbits. As early as 1824, Coney Island was a summer play area for the rich and famous visiting from New York City and Brooklyn. The growth of the area remained the same until the Civil War. After the War, five railroads were built from different parts of Brooklyn and Coney Island began to grow into a resort area and the most densely populated area in Brooklyn. This tightly and poorly built up area would contribute to some of the worst fires to visit New York City. Coney Island was located in the town of Gravesend, which was annexed, along with the towns of New Utrecht, Flatbush, and Flatlands by the City of Brooklyn on May 3, 1894. This new land more than doubled the size of Brooklyn. When annexed, the fire protection would be provided by the volunteers in the area until the City's paid force could be expanded into the newly annexed area. All of the expenses to operate the volunteers would be paid for by the City of Brooklyn. Fire protection on Coney Island was organized in late 1886 with two companies. Atlantic Hose 1, and Hook & Ladder 1 which were placed in service in a two story firehouse at 2919 W. 8th Street. 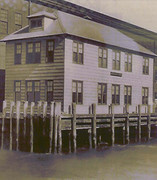 Later in 1892, a second hose company was placed in service at Sheepshead Bay Road and W. 1st Street. In 1893, two different fires struck Coney Island with each burning a large section of the island. The first fire was fought on the evening of January 6, 1893. The fire started in a drug store on the corner of Surf Avenue and W. 8th Street on a snowy, wind swept night. It burnt a bathing pavilion, the West End Hotel a well-known resort hotel, six stores, a 300 foot observation tower and many smaller building before it ran out of fuel. The fire was fought in a gale wind that blew the fire towards the ocean. The lost was set at $250,000.00. 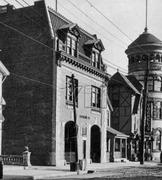 The West End Hotel was a two story wood frame building that measured 200 feet by 200 feet. In it was a bowling alley and billiard rooms in the basement, restaurants and saloons on the first floor and forty sleeping rooms upstairs. The second fire of 1893 was on June 17th and was smaller but, took out a business block and the life of a fireman. The fire started in Frishman Bakery at 2:15 in the morning. A large pot of fat was spilled, setting fire to the woodwork. The fire spread along Surf Avenue between West 11th and 12th Street, burning out eleven buildings. The loss was set at $43,300.00 with very little of it being insured. Fireman John Madden, along with several other firemen were on the roof of the bakery when an explosion inside of the building, weakened the roof. Everybody ran to the edge of the roof for safety. Fireman Madden tripped and fell to the roof just has the roof collapsed. His body was recovered after the fire was put out. By dawn, the burned out basements were being filled in with sand and new construction began before the embers were cool. Most of the buildings would be ready for business in a weeks time. After the second fire the political leaders of Coney Island ordered a new steam power fire engine that would replaced the hand power machines.The steam fire engine was ordered and arrivied late in 1893, Atlantic Engine 1 was placed in service and kept with the other machines on W. 8th Street. On December 9, 1895, the Coney Island fire companies along with Gravesend Neck and Sheepshead Bay departments were replaced by paid companies. Engine 44 (244) & Ladder 16, Engine 45 (245), Engine 46 (246) & Ladder 17, and Engine 54 (254) of the Brooklyn Fire Department were placed in three volunteer houses. Engine 44 and Ladder 16 were located in a new house on W. 15th Street. All of these companies were under the command of District Chief 13 (now Battalion 43), located with Engine 45. The first fire fought by Brooklyn's Engine 45 was on October 27, 1896. The Coney Island Elephant was built in 1876 and was the first of the famous attractions to burn. The elephant was seven stories high and over 100 feet long. Built of yellow pine and tin, it burnt to the ground in thirty minutes. The first floor had a restaurant and saloon, while the upper floors were used as a hotel. On the top was a howdad (the seat to ride the elephant), which was used as an observation deck, came crashing down in flames soon after the fire started. Also destroyed was Shaw's Toboggan Sled ride, which surrounded the elephant. The total lost was placed at $26,000.00. The elephant was seen in every photograph of Coney Island used in books during the "Gay 90's." It was never a moneymaker for the owners and it was sold several time in its short history. The elephant was located at Surf Avenue and about W. 5th Street. This location would have a repeat performance several years later. On January 1, 1898, the Cities of New York with the Bronx, Brookyln, Long Island, parts of Queens County and Staten Island merged into the Greater City of New York. The Brooklyn Fire Department became part of the FDNY on January 28, 1898 with the companies being renumber on October 1, 1899. Not a busy fire area in the beginning, Engine 145 responded to only thirty five runs in 1899 with only eleven working fires. One of these fires that year was fought on May 26th, the burning of nine blocks along the beach, from Jones Walk to Steeplechase Walk up to Bowery Street. This fire started around 2:40 in the morning after a watch man tried to put out a small fire. The fire spread from the original building before the first alarm was sent to the fire department. Engines 144, 145, Engine 144's ladder truck and Battalion 13 (now 43) arrived to find the end of Henderson Walk a roaring inferno. Because of the narrowness of Henderson Walk, the hoses had to stretched from the closest hydrant at Surf Avenue down to the fire, some 1500 feet away. Due to the poor construction and the closeness of the buildings the fire spread quickly to adjoining buildings. Once the fire was out a total of twenty six hotels were destroyed, along with 165 bath houses and many smaller buildings occupied by families. No insurance company would insure any of the buildings south of Bowery Street and the loss was estimated at $300,000.00. The four alarm fire was fought by ten engines, five ladder trucks and a fireboat. The next "Big One" was on November 1, 1903. This fire was started over a woman and destroyed fourteen blocks. Three men were fighting with the owner of the Albatross Hotel over a woman, and they started a fire in the laundry room of the hotel. The fire started at Steeplechase Walk and Bowery Street, then extended to Surf Avenue over to Jones Walk down to the beach, back to Steeplechase Walk. A total of 264 buildings were destroyed for a lost of $1,200,000.00, and 500 were left homeless. A nine year girl was killed by the fire and thirty persons were injured. The three men were arrested for starting the fire. The four alarm fire and four special calls brought a total of sixteen engines and three ladder trucks to the location. On July 29, 1907, fire visited Tilyou Steeplechase Park without paying admission. Built in 1897, by George C. Tilyou, Steeplechase Park was the first of the well known amusement parks to open. The park was famous for the mechanical horse ride known as the Steeplechase. Other rides were the rolling drums that people tried to walk through, the Spinning Floor ride and through out the park were grates with air jets that blew air up as people walked over them. At the entrance was the wide smiling face of a clown, now used by Engine 245, Ladder 161, and Battalion 43 for their patch. This fire was started under the stairs of the pavilion, probably by a discarded cigar. The night watch man found the fire around 3:45 in the morning and turned in the alarm. He pulled the master box for the Park but, did not turn the handle inside. The fire burned for twenty seven minutes before the alarm was finally turned in. The fire spread quickly to adjoining buildings. By Coney Island standards this fire was small, only seventy four building were burnt in a four block area, along with Steeplechase Park. Fireman Gottfried Messerli, of Engine 245 was hit in the head by a falling beam. He died on August 2nd has result of the injuries. The four alarm fire was under control in two hours and was fought by twelve engines and four ladder companies. Steeplechase Park would be rebuilt and it was closed in the 1960's. Less than a year later, July 9, 1908, the Pabst Loop Hotel, the Vanderveer Hotel and the Culver depot of the Brooklyn Rapid Transit would be victims of the "Red Devil". The name of Pabst Loop Hotel came from the fact the hotel was curved and the BRT tracks looped around the building to change direction back to Brooklyn. The loss for these three building was set at $200,000.00. Located across the street from Dreamland, on Surf Avenue and W. 5th Street, the firemen had visions of the Island burning again. The new high pressure water system was ordered turn on and several hose lines, hooked to the hydrants were soon operating. The fire was held to these three buildings. The new high pressure system saved the Island from burning. With the new water system the big fires of the past appear to be a distant memory. Dreamland open its doors in 1904 and cost $3.5 million to build. 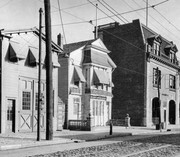 It was located on Surf Avenue between W. 10th and W. 5th Streets to the ocean. A 400 foot long iron pier stretched from the park out over the ocean. The park was laid out with wide walkways and sites, like the Canals of Venice, the waterfalls of Pompeii, and the Tower of Seville. Attractions included the Leap Frog Railway, the Fighting Flame Show, Chariot races and the Hellgate, a cross between the water rides of today and the Tunnel of Love ride. Dreamland also had one of the first "wild animal" park, though be it in cages. On the morning of opening day, May 27, 1911, Dreamland would change forever. The fire started around 2 A.M., from an explosion of some light bulbs that were near a pail of tar in the Hellgate that was being repaired. Built of pine, paper mache and freshly painted for the new season, the fire spread very quickly. The high pressure water system was down for repairs. Instead of water pressure being 150 pounds, it was meager 25 pounds. The Tower of Seville, was 80 feet tall and could be seen over ten miles out to sea when the lights were turned on at night, burnt in thirty minutes. The fire spread through out the park trapping the wild animals. Some of the animals had escaped and were driven mad by the flames, were fighting each other before being consumed by the flames. One lion escaped into the streets with its' mane on fire, frightening everybody, including the firemen. The police cornered the frighten lion and pumped him with bullets to no avail. The lion charged the policemen and was hit in the head by an ax, that one of the policemen had borrowed. All of the animals were destroyed in the fire. 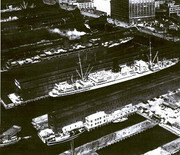 The fire also spread to the 400 foot long iron pier used by excursion boats from Manhattan. It also had several restaurants and fishing areas on it. Nobody thought of notifying these people of the fire, trapping several fishermen and restaurant workers. They were rescued by a police boat. By the time the fire was out a total of fourteen acres from W. 5th Street to W. 12th Street, were burnt and destroyed. The only thing to save Coney Island from completely being wiped out was the shift in the wind. It changed direction, blowing the fire toward the ocean and away from the buildings. The fire went to a fifth alarm and two Borough Calls, (a 3rd alarm assignment in another Borough that responded to this fire). As beautiful as Dreamland was it was never a profitable operation and was never rebuilt. The loss was estimated between $3,000,000.00 and $5,000,000.00. The land was turned over to the City and made into a park. Today, the New York Aquarium sits on the famous Dreamland site. It would be twenty one years before the next big one would strike the Island. This "Big One" was not in the amusement area but, mostly a residential area that has not been visited by fire. Before the day was over, Wednesday, July 13, 1932, five blocks, would be wiped out. The fire was started by four boys doing their civic duty of cleaning up rubbish under the Boardwalk at W. 22nd Street. With no place to put the rubbish, they decided to burnt it. The rubbish was tinder dry and a forty mile an hour wind was blowing off of the water. The first alarm was transmitted from the box at Neptune Avenue and W. 21 Street, three block away at 3:14 P.M.. A minor fire and probably not visible, it was made a false alarm. The next alarm received was at 3:26 P.M., bring Engines 318, 244, 245, Ladders 166, 161, and Battalion 43 to the fire's location. The companies attack the fire that had spread to several concession stands by the time first company had arrived. Due to the high winds, the flames were jumping at will and setting buildings on fire behind the fire lines. The fire burned from W. 21st Street to W. 24th Street, along the Boardwalk, to Surf Avenue and to Railroad Avenue between W. 22nd and 23rd Streets. A total of 178 building were destroyed. These included; seventy five, one story, eighteen, two story buildings, fifty six, three story buildings, four, four story buildings, one, six story apartment building, housing over 200 families, twenty four bath houses, and over 100 automobiles. The fire took a fifth alarm response pus two Borough calls and the recall of the off going shift at 6 P.M. to stay in the firehouses until the fire was under control at 12:32, the next morning. A total of forty three engines, twelve ladders, two rescues, one search light, two fireboats, one ambulance and two gasoline fuel trucks responded along with sixty men without apparatus. The fire left over 1000 homeless and over $5,000,000.00 in property damage. The one good thing coming out of this fire was that $400,000.00 would be used for a new high pressure water system. The next great fire of Coney Island was at Luna Park on August 12, 1944. The Park opened in 1903 and cost $600,000.00 to build. The park contained 38 acres and was located on the north side of Surf Avenue between W. 8th & 12th Streets to Neptune Avenue. One of the main attractions when the park opened was the Trip to the Moon ride. In a dark room people would board spaceships and travel to the moon and outer space. The Park was decked out with over 1,000,000 light bulbs on every building. In the beginning a large crowd at Luna Park would be around 80,000 to 90,000 per day. The first year 4,800.000 people visited Luna Park, making it one of the most profitable of the amusement parks. By the time of the fire a good crowd would be under 20,000 per day. The fire started in the washroom of the "Dragon Gorge" a roller-coaster that was made of wood and measured 60 feet high, 100 feet deep and, 90 feet wide in the front. As with all the other fires in the area, employees try to put out the blaze before calling the fire department. The delay in sending in the alarm by several minutes help to spread the blaze. Within 25 minutes of the first alarm at 3:45 P.M., five alarms were transmitted, bring twenty six engines and eight ladder companies to the fire. The high pressure system was boosted up to 175 pounds of pressure. After the fifth alarm a simultaneous call (a fifth alarm assignment) for Brooklyn Box 1227 (8th Ave. & Union St.) was transmitted for a total of sixty two companies operating. During the height of the blaze, the 125 foot Coca Cola tower came crashing down missing several companies operating near the tower. Due to the flying embers, many places were in grave danger of burning also. On of these, was the Brooklyn Borough Gas Company gas tanks. Unfortunately several blocks away, twenty old wooden BMT railroad cars started to burn. This went to four alarms just to get enough equipment and men to handle this fire. The Park fire was under control after 5:00 P.M.. A total of twenty eight rides were destroyed, about half of Luna Park. Thirty five people were injured, and the lost was placed at $500,000.00. The last of the big fires was on May 12, 1947. The fire started in rubbish behind 1228 Surf Avenue. This fire burnt through a dozen or so building between Surf Avenue to Bowery Street, and Henderson Walk to W. 12th Street. This area has been wiped out by fire on at least three other times. The fire was a fifth alarm assignment and injured forty five people, mostly firemen. Today, this area is just west of the Astroland amusement park. Over the last one hundred years, there has been hundreds of other fires. The above stories are the biggest to visit Coney Island. Some of the other fires include, Steeplechase, again in 1939, Cox Baths, in the fall of 1939, Mardi Gras in 1940, and the Chamber of Commerce, just to name a few." 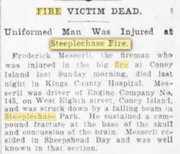 FF Gottfried Messerli - July 29, 1907 - Steeplechase Park fire - FF Messerli hit in the head by a falling beam. He died on August 2nd has result of the injuries. RIP. Captain Charles Furey - February 14, 1930 - "A veteran with thirty-nine years of service in the Department, died from suffocation while fighting a small blaze in an unoccupied candy stand at West 10th Street and the Boardwalk, Coney Island. Captain Furey, who was in command of Engine 245, collapsed in the midst of the smoke and was pronounced dead at Coney Island Hospital. The blaze was started in a pile of rubbish. 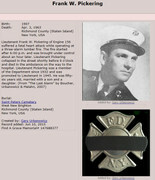 The veteran fireman was promoted to Captain 29 years prior to his death and was Captain of Engine 245 since 1910. He was sixty-one, married and left behind seven children with two sons who were patrolmen in Brooklyn. (From "The Last Alarm" by Boucher, Urbanowicz & Melahn, 2007)"
Original volunteer quarters are left of former BFD firehouse built in 1904. 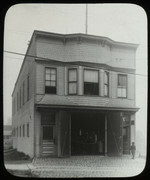 Atlantic Hose 1, and Atlantic Hook & Ladder 1 were established in 1886 in the two story firehouse at 2919 W. 8th Street. Notes: - Victory Blvd originally called Richmond Turnpike. No deck guns, just large hoselines strapped down to keep from flying loose. Engine 156/Brush Fire Unit 3 - Firehouses - 412 Broadway West Brighton, Staten Island 8th Division, 21st Battalion "The Broadway Express"
Died while responding to Box 383. MPO Doran was driving Engine 156's new Nott engine when apparatus crashed due to malfunction at 1560 Castleton Avenue. FF Doran was thrown from apparatus. Died from previous line of duty injuries sustained. West Brighton, SI neighborhood: originally called "Factoryville"